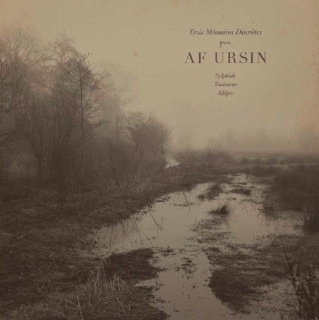 Af Ursin is the solo project of sound artist/improvising composer Timo van Luijk. With structured improvisations on a variety of old acoustic and electric instruments, he creates personal free-form arrangements covering different musical styles. He is the founder of the label La Scie Dorée. Trois Mémoires Discrètes is his fourth full album. It includes 3 introspective instrumental compositions performed, recorded and mixed by Timo van Luijk during 2010-2012. This is a truly hypnotic listening experience, a dream like otherworldly layers of ecstatic ritualistic passages. There are supremely atmospheric and even melancholic sounds, while the condensed overall effect seems filtered by a patina of ritual incantations and magic ceremonials. A great album by a master of sound.